President of former Soviet Republic famously demolished tiny community's last remaining synagogue. No change of gov't expected. The former Soviet Republic of Tajikistan will be holding national elections tomorrow (Wednesday), and is expected to re-elect incumbent President Emomali Rakhmon, who has already served a seven-year term. There is no telling what this could mean for the Republic's small community of Bukharan Jews, whose only synagogue - which also held the only Tajik mikvah, kosher butcher, and Jewish school - was destroyed by the Tajik government in 2006 to make way for the new Palace of the Nation. 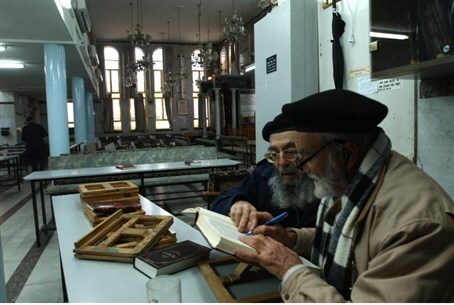 While the community managed to rededicate the synagogue in a different location in 2009, life for Tajiki Jews has been difficult under Rakhmon. Tajikistan's population is overwhelmingly Sunni Muslim, with the country's small minority communities accounting for a mere 1%. Tajikistan and Israel maintain full diplomatic relations, through the Israeli embassy in neighboring Uzbekistan. The majority of the Taijk Jewish population has either emigrated to the US, mostly at the turn of the last century, or made aliyah to Israel and established a sizable community in Jerusalem. While an estimated 15,000 Jews lived in Tajikistan in 1989, almost none remain. According to AFP, Rakhmon, then known as Rakhmonov, became head of state after the start of the civil war in 1992 and was first elected president in 1994. Credited with pushing a peace accord that ended a 1992-97 civil war, he was re-elected in 1999 and 2006. A 2003 referendum had extended the presidential term to seven years and allowed Rakhmon to stand for another two terms. Rakhmon's party, the People's Democratic Party, won a crushing victory at February 2010 legislative elections, but international observers have complained of major irregularities in the polls. Tajikistan is reportedly one of the poorest ex-Soviet countries, where around 40 percent live in poverty. Almost half the GDP comes from remittances sent by migrant workers living in Russia and Kazakhstan, mostly doing low-paid manual labour. Income per head last year was only about $860 (630 euros).